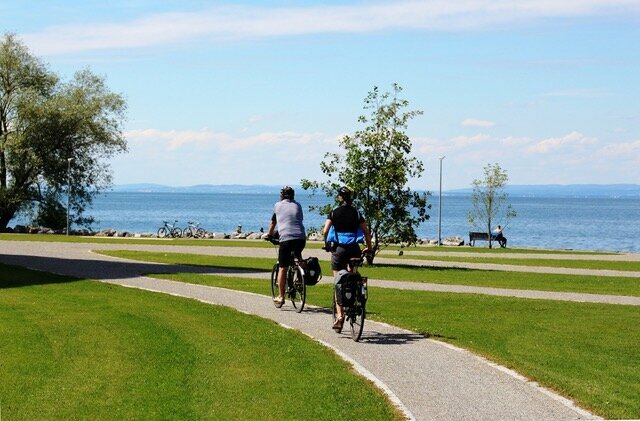 Transport yourself to the stunning landscape of Lake Constance (the “Bodensee” in German), whose pristine waters and fertile shoreline set the stage for one of Europe’s most well-acclaimed bicycling trails. 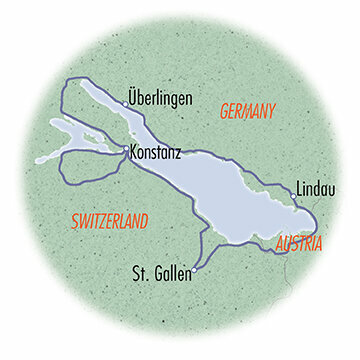 We ride the gentle grades of the separated bike path and quiet roads as the route wraps around the lake from Germany into Switzerland and Austria. 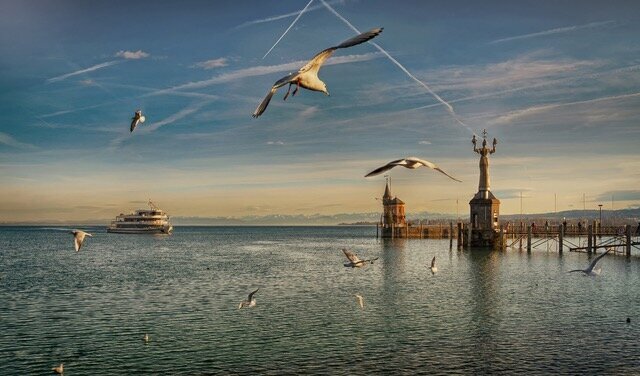 Each country hugs its own section of lakefront and offers its own distinct cultural flavor. Enjoy the quiet rides from one picturesque medieval town to the next, all framed by panoramic views of the Alps. Rolling and flat terrain on a mix of paved bike paths and quiet roads. Moderate cycling level. Leisurely level with an electric-assist bicycle. 7 nights lodging, 7 breakfasts, 5 dinners, snacks, rental hybrid or road bike, van support, cue sheets, and trained bilingual guides. Hybrid or road bike is included. Fly in and out of Zurich, Switzerland. Then take a train to our starting hotel. 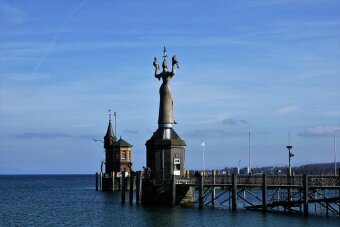 DAY 1: We gather in Konstanz, Germany a centuries-old European crossroads that has evolved into a bustling university town. Join us for your rental bike fitting and then spend the afternoon enjoying the city’s vibrant culture and rich history. 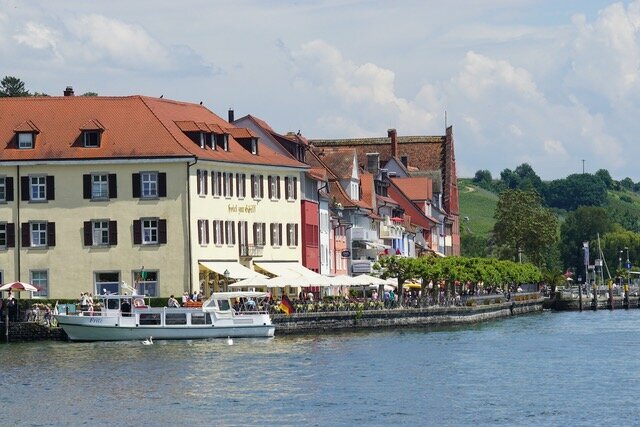 Explore the Old Town of Niederburg and its 11th century Münster Cathedral, visit the harbor to watch the sailboats navigate the sparkling waters, or relax with a beer at one of the many German biergartens. 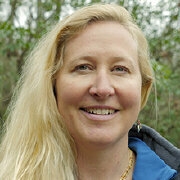 In the evening, we reconvene for an orientation and dinner together. 0 miles. 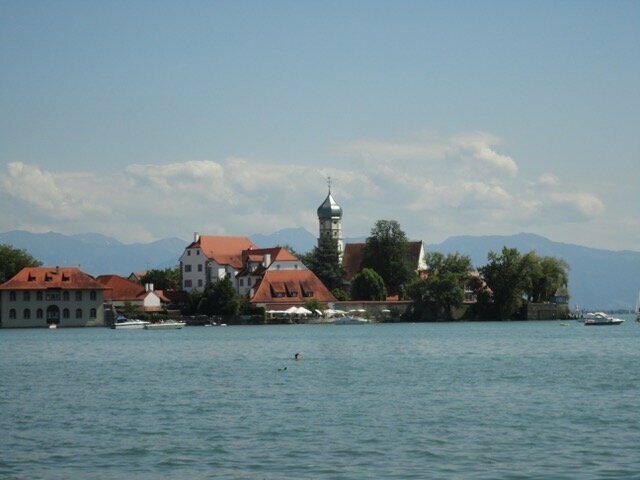 DAY 2: We begin our exploration of Lake Constance with a loop ride that takes us across country lines to one of the best preserved medieval towns in Europe: Stein am Rhein, Switzerland. Here, the Rhine River leaves Lake Constance to continue its course through Switzerland, forming the Rhinefall, the highest waterfall in Europe. 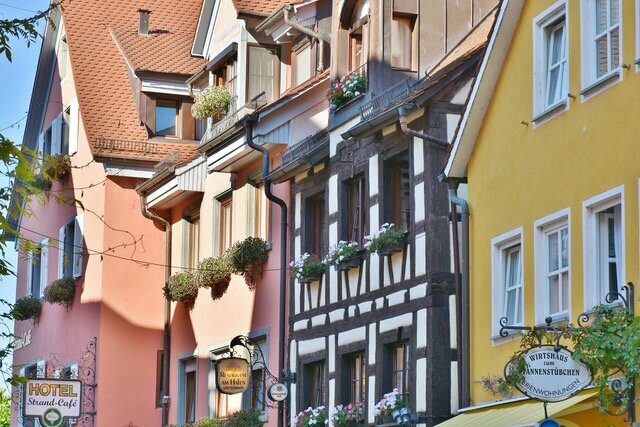 Enjoy lunch beside the fountains of the Rathausplaz—the square of the City Hall—and take time to admire the intricately painted murals upon the facades of its half-timbered houses. 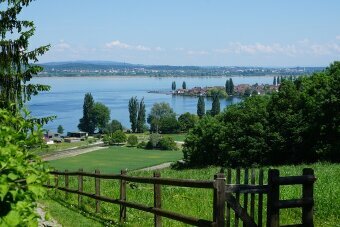 After lunch, we cycle back to Konstanz along the Hori peninsula where we will soak in sweeping views throughout the volcanic Hegau landscape. You may also opt to ride a shorter loop to the monastic island of Reichneau, declared a UNESCO World Heritage site for the spiritual, intellectual, and artistic influence of its Benedictine Abbey and three churches built during the 9th-11th centuries. 22 or 47 miles. DAY 3: Today we leave Konstanz behind and take to the peaceful Swiss countryside. Drink in the fresh air as we ride through woodlands and meadows populated with medieval castles and apple and pear orchards. 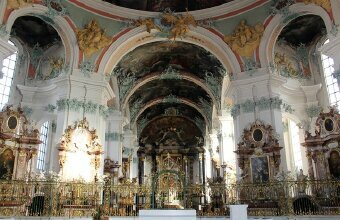 We spend the evening in St. Gallen, home of the Abbey Cathedral of Saint Gall, whose renowned library contains thousands of books from the 9th century. 28 miles. DAY 4: Today we pedal through three countries! Following breakfast, we ride up into the Appenzeller landscape, a region famous for its folk music and rustic dances. Its alpine cheese has been produced in the same tradition for 700-years. As we ride through a series of spa villages, we will take in phenomenal views of the lake below until we descend and cross over the border into Austria. Our home for the next two days is the Bavarian town of Lindau, whose old town lies on an island across a short bridge from the mainland. 46 miles. DAY 5: There is truly something for everyone to enjoy on our rest day! 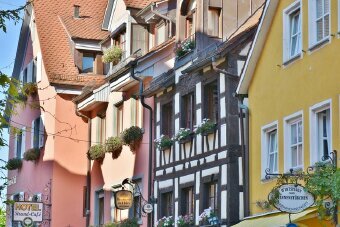 Take a guided historical walking tour of the city, visit Maximilianstrasse, Lindau’s boutique and café-lined main street, or spend the day relaxing at the chic Schachen Bad & Spa. If you’re feeling adventurous, you can hike or cable car ride up Pfänder Mountain for sweeping views of over 240 alpine peaks and the gorgeous lake below. 0 miles. DAY 6: Today we rejoin with the rhythm of the bike path along Lake Constance’s northeastern shoreline. 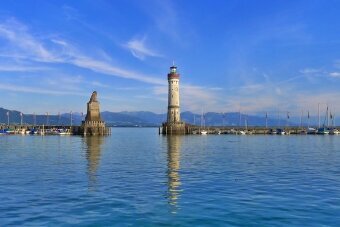 Before we know it, we find ourselves in the city of Friedrichshafen, birthplace of the Zeppelin airship. 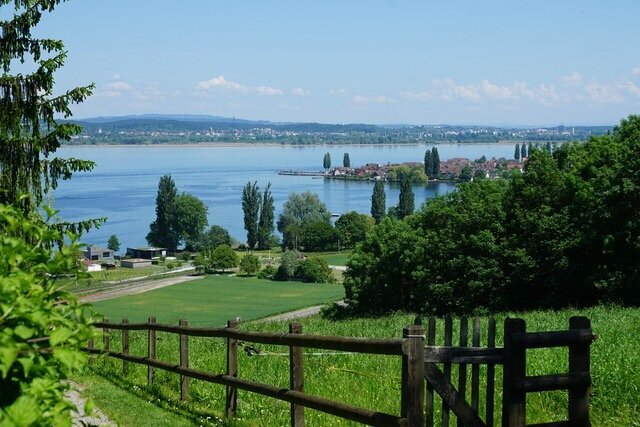 Farther along the path in Unteruhldingen, we’ll have the opportunity to delve deeper into history at the open air Pfahlabu Museum and archaeological site. Take a guided tour though reconstructed Neolithic and Bronze Age stilt houses and view ancient artifacts from the early peoples whose civilizations thrived along the lake. 33 miles. 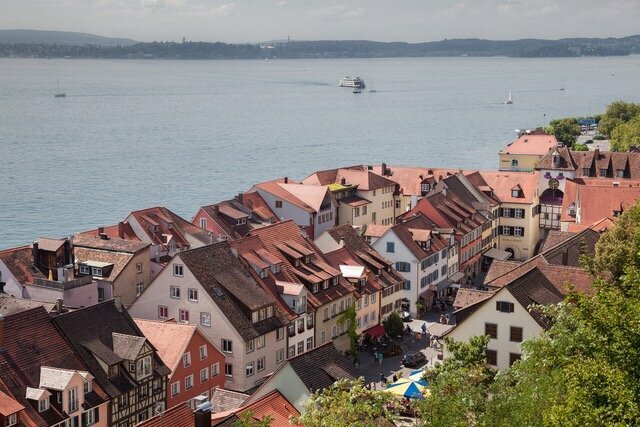 DAY 7: After a hearty breakfast, we will complete our full lake loop, passing the Insel Mainau, a 100-acre island once inhabited by Knights of the Teutonic, responsible for protecting Christians during the Middle Ages. Today, the island attracts international attention for its elaborate flower gardens that line nearly every street. Walk the pathways lined with tulips, rhododendrons, roses and dahlias. 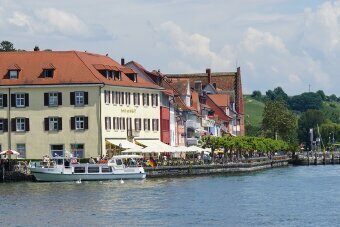 We cycle our final few miles back to Konstanz and have time to enjoy the lively atmosphere of the harbor before celebrating over our last dinner together. 29 miles. DAY 8: After a final breakfast, we say our good-byes. Take a short taxi ride to the Konstanz train station, where you can hop on a train to the Zurich airport or your next European destination. 0 miles.